Wine lovers call it a "vertical" tasting. That's when, instead of the typical "horizontal" tasting of a particular region, type or vintage of wine, a single wine from a single winery is chosen and various years are compared. Besides gaining tremendous insight as to how a particular grape matures, this type of tasting subjects the winemaker's skill to the highest degree of inspection and dissection. In the High-End we often do horizontal tastings of, say, CD players from $2000 to $3000, but vertical tastings of all of a particular manufacturer's products of a similar type are seldom, if ever conducted. I've long held that one reason for this is that the products of a single designer often have differences that are very subtle, and in fact may only show themselves on a spec sheet. So, when Mike Fenech and I were asked by Nordost at CES '97 if we wanted to hear a demo of their complete line of interconnects, from the $40/.5m pair Magic 1 to the $900/.5m pair SPM Reference, like the responsible journalists were are, we shoved three old ladies out of the room, slammed the door in the face of two prospective distributors, vaulted into the front row center chairs and calmed replied, "Damn Right!" The Nordost folks, bravely, allowed us to choose the music and then started the demo. The Magic1 gave a musical but bass shy and slightly coarse presentation. All in all, I thought, pretty good for $40. Then the show really began. With each step up the family tree bass grew in extension and power while imaging solidified and depth grew. Each new model, Black Knight, Blue Angel, Blue Heaven, Red Dawn, and finally the SPM Reference, presented a sonic picture that grew in detail, clarity, involvement and harmonic accuracy. The degree of change was large with the earlier models, and narrowed as you went up the price list, but the differences were still very real, and very significant. Stunned, I left the room with a newfound respect for the designers at Nordost - I figure it this way, anyone who can perform such effects must know what they are doing - as well as a small bit of guilt for the older gentleman I hip checked over the 2nd floor railing while clearing the room. With that as prelude, I'm sure you can understand my excitement when I found a box of Red Dawn cables from Nordost on my front door late last winter. Nordost, based in Framingham MA, is a new company to the High-End, but not to wire and cable manufacturing. They have been involved in the design and manufacture of wire and cable products for the aerospace, medical, military and computer industries and so bring a wealth of technical expertise to the design process. While notable for their flat cable construction and geometry, unlike many other High-End cable companies who emphasize either geometry or component quality, Nordost believes equally in both. Even their entry level Magic 1 interconnect is composed of 6 9's (99.9999%) pure oxygen free copper. The Blue Heaven adds one more 9 to that purity rating, and both the Red Dawn and the SPM Reference use 8 9's OFC. Starting with the Blue Angel, each strand of OFC is also covered with an extruded silver surface. Besides purity, wire shape is also important to Nordost, as each wire (with the exception of the Blue Angel) uses solid rectangular shaped wire. Wire of this type is not new, Tara has used it for several years, but what Nordost does with it is unusual. Whereas the Tara RSC® cables take their stands and twist them around a central dielectric, Nordost lays each strand on a parallel path, creating a wide, flat wire. Dielectric used in all Nordost cables, with one exception (the budget priced Octava speaker wire), is Teflon, extruded with a very tight tolerance, which creates wire with extremely precise and repeatable electrical characteristics, regardless of length. Nordost, going against standard thinking, feels that bulky connectors impede, rather than assist good connections. Accordingly, the spades on the speaker wire I received from them, while very strong, are not in the Cardas/Schwarzenegger size classification. The Nordost banana, called the Z Banana Plug, is also unusual. Basically, a sheet of metal rolled into cylindrical shape, it is not sealed at the end or along the seam. Instead the seam has serrated edges, which compress towards each other when inserted into a jack. Once inserted, the fit is tight and yet the banana reforms when removed from the jack. RCA plugs are spring loaded and also create a tight connection. Besides these design details, of particular interest are the electrical characteristics of the Nordost cables. Capacitance for the Red Dawn speaker wire is 7.0pF/ft, or from 1/2 to 1/10 of what typical High-end wire measures at. Inductance, at 0.09uH/ft is also extremely low, about 1/2 to 1/4 of typical audiophile wire. Impedance, on the other hand, is 110 ohm, which is considerably higher than the norm. Nordost also claims that typical audiophile wire transmits signals at about 60-70% of the speed of light, while their wire transmits at about 95% the speed of light. Now, I'm not the right guy to riff on these statistics and spin a mathematical or electrical song about the meanings of these numbers, but I do offer them as factual reasons why there could/should be differences between Nordost wires and what you are listening to now. Of course, all those numbers mean nothing, if the aural truth is missing. So, on we push to Denver for the acid test. With wires that measure as uniquely as the Nordost cables it's essential to try them with a variety of equipment, and that's just what I did. DAC's used were the Audio Alchemy DDE 3.0 and The Parts Connection Assemblage DAC 2.0. Pre-amps were either the Audible Illusions L-1 or the Exposure 19 (reviewed elsewhere in this issue by the esteemed Mr. Fenech). Amps included the McCormack DNA-0.5 Deluxe, the Exposure Super 18 (also reviewed by our own MF), my long term $2k reference Warner Imaging VTE-201S, and the hybrid, 25 watt, pure class A, Blue Circle BC-6 (review in the works). Speakers were a equally varied lot, including the SoundLab Dynastats, Platinum Audio Studio 1, PSB Stratus Silvers and the Dunlavy SC-III's (yes, the review of the III's and the interview with John Dunlavy are still on tap, look for them soon). After all the pains I've gone to, pointing out the unusual characteristics of the Red Dawn wires and detailing the jumble of equipment used in this review, I'm going to deflate all that by saying that the Red Dawns mated well with everything I used. In months of use and in a nearly countless number of component combinations not once did I hear a bad wire/component mix. Like I said earlier, I'm not the guy to pronounce electrical judgment on the Nordost line, but from an aural perspective they were nigh well impeccable. In fact, that impeccablity causes a problem. Like the Zen koan, describing the sound of the Nordost cables is tantamount to describing the sound of one hand clapping. Forging ahead anyway, I'll try to describe this one hand clapping sound, starting with the interconnects. Whether placed between the source and pre-amp, or pre-amp and amp, the Red Dawns had a detailed, accurate and musical presentation. Extension, both top and bottom, was superb, with no limitations at all. Dark recordings were dark, while bright ones were bright. Air, often confused for high frequency emphasis, was natural and flowing. Classical recordings with significant treble content, and especially jazz disks with lots of cymbal activity, were played back with remarkable fidelity. To confirm that I even went so far as to borrow a set of cymbals from the neighbor kid. Really! Bass was fast and as deep as allowed by the associated equipment. However, the bass did show one slight area of concern. When used between the source and pre-amp harmonics were ever so slightly to the lean side. This deviation was very slight, and was less noticeable, in fact barely discernible, between the pre and power amps. Mids were also very natural. Female vocal, such as those on k.d. lang's newest, Drag, were as real as I've heard in my listening room. Piano reproduction was extremely nuanced, but never pushy or in your face. In fact, the Red Dawn's presentation was the very antithesis of pushy. Relaxed, flowing and natural and their synonyms were the only words I found in my listening notes. Staging was also superb. Right to left was accurate and players were extremely solid. Depth was layered and as far back as the recording allowed. For example, Arvo Part's Fratres (the Telarc disk of the same name has 6 versions of the same work, I'm referring to first track) begins with percussion about 30 feet back from the mic, and echoed beautifully in the Basilica of Bonne Esperance in Belgium. With the Nordost interconnects (and speaker wire) the church came alive and the soloist were indeed 30 feet back there. Dynamics, of both the macro and micro variety, were also quick, accurate and appeared limited only by the other links in the chain. All in all I found the interconnects, at $400/meter pair, to be the equal of any cables in my experience. The only flaw I found, and it is slight at that, is the bass leanness I noted earlier. In contrast, the Audio Magic Sorcerer (at $649/meter pair) has many of the same attributes of the Red Dawn, but errors slightly to the warm, full side in the bass. Compared to the Cardas Cross, my long term reference at this price point, the Nordost cable is cleaner, slightly quicker and has a more detailed and natural top end. To the Cross's credit, it has the edge in the bass where it's fuller sound seems more accurate to my ears. Currently I'm using the Cross between the DAC and the pre-amp and the Red Dawn between the pre and the power amp. In my system this is a good balance. As for the speaker wire, it sounds even more like one hand clapping. Used in a bi-wire configuration on the PSB's (kinda silly to do, since at $1400 for a bi-wire pair the Nordost costs almost as much as the speakers do) bass locked in like Ken Griffey Jr. on a home run spree. Tight, deep, rhythmic, powerful and accurate. Here there was no leanness at all, just flowing, effortless, musical bass. This bass control was equally evident on the Platinum Studio 1's, and was simply astounding on the Dunlavy SC-III's. Depth was as overwhelming. Listening to the Joni Mitchell HDCD re-issues was like inviting Joni and the boys over the night. The front wall was pushed back 15-20 feet and musicians took their places. The best thing was that they came back night after night! Highs were (and are) extended, natural, smooth and grain free, with mids every bit the equal of the interconnects. To conduct a fair test I listened to the Nordost in single wire mode as well, since my Cardas HexLink 5-C is single wire. 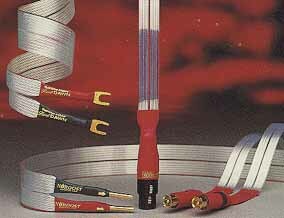 In bi-wire form the Nordost wire had easily distanced itself from the Cardas speaker cable. Single wire was closer, but still the Nordost edged it out. The Red Dawn speaker wire, much like the interconnect, was cleaner, quicker and more detailed than the Cardas wire. However, unlike the interconnect, the bass could go toe to toe with the HexLink. I don't think that the Red Dawn is the perfect cable for all systems. In an overly analytical system the Cardas would be a better choice than the Nordost cable. But, if you are searching for accuracy from your cables and willing to live with the results, Nordost gets my vote. What you do with this review is up to you. I know I used strong descriptive language to describe wire, and if you expect to go buy any wire and have it transform your system you are in for a quick trip to aural bankruptcy court. My descriptions are accurate but also deal with differences that can seem unimportant to others, and, compared to changing a source component, are slight. For example, my wife can not seem to hear depth in recordings at all. Yes, she hears the bass extension and treble purity quite fine and enjoys it very much, but for her much of the magic of the Red Dawn twins is hidden. Also, while the Red Dawn's worked very well with each system setup I used, they took the largest leap into the great beyond when paired with the Blue Circle amp and the Dunlavy SC-III's, which are reference quality pieces themselves. With that in mind, the Red Dawn wires, and especially the speaker wires, are just about the cleanest, quickest and most natural wires I've yet to hear. Stunning. Thank you for taking the time required in writing such an in depth review on Red Dawn interconnects and speaker cables. It is always gratifying when one of our products receives such a favorable critique. In this case, it is apparent that you have taken the time required to understand what we are accomplishing in terms of advances in the cable industry. As you have noted, our cables are extremely fast. They are generally 20 to 50% faster than most competitor's products. The advantages of a high speed design such as Red Dawn is that the leading edge transients are not lost. The starts and stops in the music are extremely precise and very fine details become audible. During our product demonstrations we normally use difficult and sometimes badly recorded CDs to show how our cables can make many of the recordings we own more enjoyable. We appreciate that you have found Red Dawn to be this way and that you have shared your findings with your readers.